Blue Jay comes to the big feeder and bosses everybody around. But he is afraid of Woodpecker. He’s more jittery around the black and white striped fellow. And it takes more bluster to get Woodpecker off the big feeder, whereas, the little guys frighten easily at the least flutter or squawk. In an attempt to get Woodpecker to shove off, Blue Jay flaps and caws. The feeder swings crazily like boat on a stormy sea. From my desk, I call at him, “Stop that. Go away!” Three times I admonish. Blue Jay flies to a nearby branch to spy on his enemy. And to try to shut me down, he tilts his head and directs his left eye at me, the source of rebuke. I speak more kindly to him now, from my seat inside by the window. I remind him of the other, smaller feeder. Tell him he doesn’t have to share. Tell him he can have his very own feeder. He flies deeper into hiding in the tree’s leafy middle where I am unable to see him. I imagine he is feeling chastised, and so, irritated with me. I figure he thinks I just didn’t understand his importance and why he, not Woodpecker, should have the feeder Woodpecker was hogging. 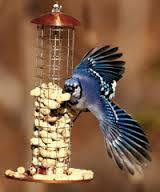 By rights, shouldn’t Blue Jay have the bigger feeder? Tufted Titmouse suddenly lands on the roof of the second, smaller feeder, now unafraid of Blue Jay hanging back in the tree. And then Squirrel takes small squirrel-sized leaps in slow, careful, motion. He looks around nervously after each jump, as he heads to the base of the feeder where a carpet of sunflower seeds awaits. Evidence of many feeder squabbles. Seed spillage is the day’s main course for many visitors. And then comes Blue Jay. Which I like to imagine is because I told him so. He flies to the smaller feeder and I feel gratified. Woodpecker continues tapping at a spot on the big feeder, heedless of nearby activity. And suddenly a whoosh, another whoosh, and three of Blue Jay’s relatives join him at the smaller feeder. All goes well. And before too long, those in attendance disband. Minutes later, Blue Jay alights on the east side of the larger feeder. It rocks gently and Woodpecker, already there, stops pecking. Focused and unmoving, he eyes Blue Jay briefly. Woodpecker then turns back to his work to extract seeds from the feeder. The two are on either side of the large feeder but Blue Jay doesn’t make his usual, noisy squawk. Rather, he sits there silently glaring at his black and white striped nemesis. Woodpecker stops now and returns the glare with indifferent curiosity. They are still for thirteen, then fifteen, seconds. And then sudden movement when they both begin tapping their beaks into the feeder with vigor. There seems to be some kind of resolution. An unspoken agreement to disagree. Maybe.